It’s officially Thanksgiving week (!!! ), and I’ve got one thing on my mind: All the food. May I offer up the perfect, last-minute side dish for your holiday table? I present this simple delicata squash bake that’s naturally sweet and bursting with color and flavor. And because I know you’re busy, this recipe takes just 30 minutes from start to finish. Let’s do this! Funny story: I thought I hated delicata squash (before I ever tried it). These are seriously my thoughts. I didn’t want to like this squash. It honestly seemed too difficult to work with, and not worth the fuss. So you can imagine my anger (and relief) upon trying it for the first time a few weeks ago and totally loving it. Isn’t this how all good love stories go? 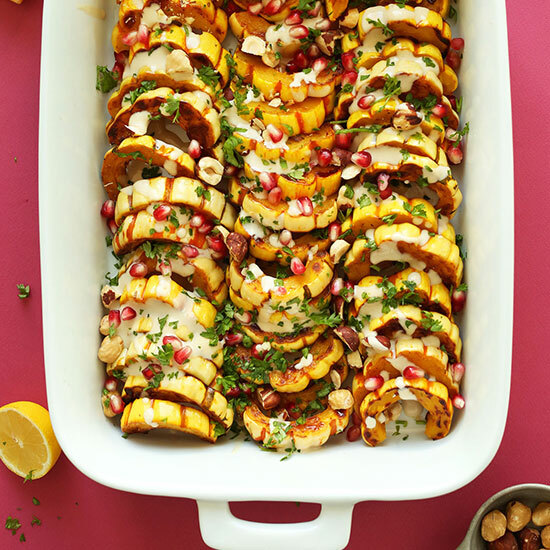 This dish is simple in nature: Baked squash, creamy tahini sauce, pomegranates, hazelnuts, and fresh parsley. It’s a symphony of texture and flavor, and utilizes some of autumn’s best produce. In other words, it’s oh-so worthy of gracing your dinner table. This would make the perfect side dish for Thanksgiving, and in reality, for as long as squash and pomegranates are in season. I could even see this being a single lady dinner when John’s away (he’s not much of a sweet squash guy, which totally works out in my favor). If you give this recipe a try, let us know! Leave a comment, rate it (once you’ve tried it), and take a picture and tag it #minimalistbaker on Instagram! We’d love to see what you come up with. Cheers, friends! 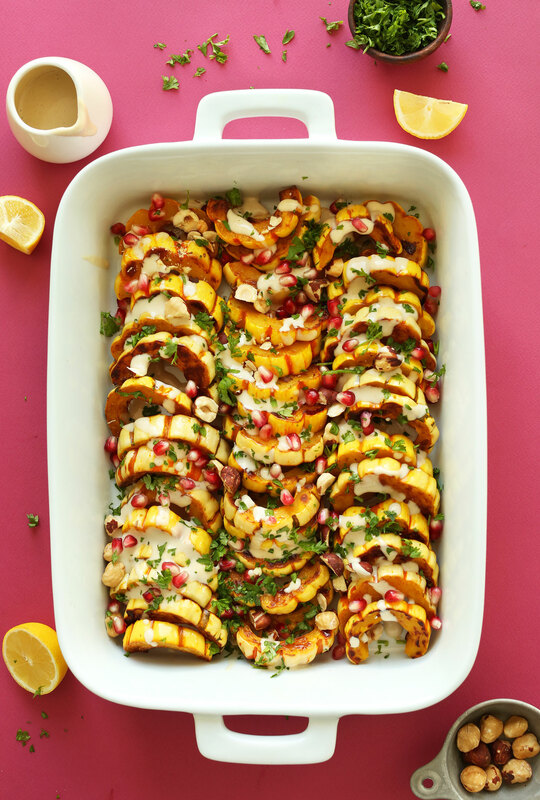 Simple, 30-minute delicata squash bake with toasted hazelnuts, pomegranates, and a maple-tahini sauce! The perfect plant-based Thanksgiving side dish. 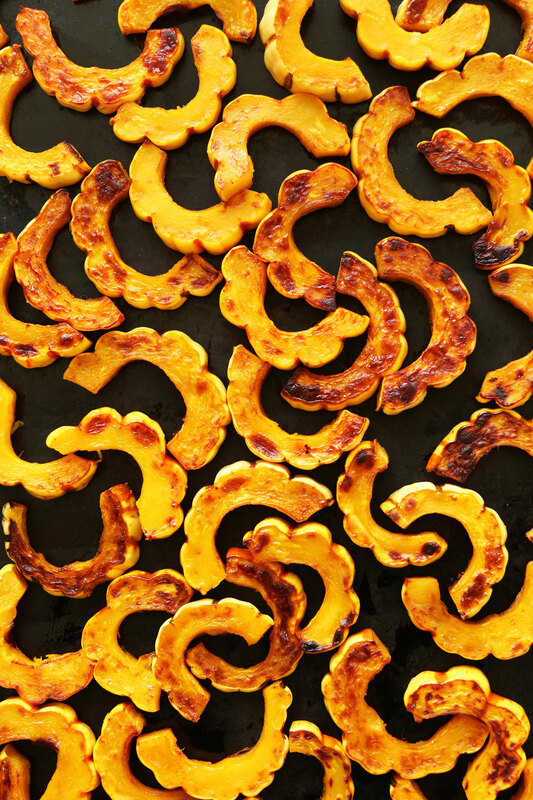 Add sliced squash to a bare baking sheet (1 large or 2 small, depending on size of squash // as original recipe is written // use fewer or more baking sheets, as needed, if altering batch size) and toss with oil and sea salt. Then arrange in a single layer. Bake for 20-25 minutes, flipping once at the halfway point to ensure even baking. You’ll know it's done when fork tender, golden brown, and slightly caramelized (see photo). While squash is baking, prepare dressing by adding tahini, lemon juice, and maple syrup to a small mixing bowl. Whisk to combine, then add hot water 1 Tbsp at a time and whisk until pourable. Taste and adjust seasonings as needed. To serve, arrange baked squash on a serving dish and top with dressing, pomegranates, hazelnuts, and parsley. Best when enjoyed immediately. *Nutrition information is a rough estimate calculated with tahini sauce. I plan to make this for a holiday get-together and most don’t care for either hummus or tahini. Family… you can’t pick ‘em, but I still love ‘em. Can you suggest a different ingredient? Hmm you could try using a cashew butter, perhaps? It would change the flavor but should work. Let us know if you experiment with it! Excellent recipe! I found that tossing the squash with 1/2 tsp. turmeric, 1/2 tsp. garlic powder, and a little crushed black pepper before baking gave it a little more zing. I really like the tahini sauce with the maple syrup instead of tamari – thanks so much! I am taking this to a Thanksgiving gathering this week. I discovered your blog googling around for a side dish to bring to family Thanksgiving, and I’m so happy I found it! This was really yummy and filling and easy, and I got a million compliments on how pretty it was. At first I was thinking of making some kind of stuffed squash halves, but I’m glad I went with this instead because it was so shareable, everybody ended up taking a scoop (omnivores and veg*s alike). To top off the long TG weekend I ended up making your blueberry breakfast cookies and sweet potato / lentil / balsamic mushroom shepherd’s pie too, and everything was great. Beautiful recipes too! Thank you! Hi! Wondering if I could use walnuts instead of hazelnuts for recipe? Hi Rebecca! We haven’t tried it but it should work! So this goes on the baking pan without any foil or parchment paper? Hi Cynthia! Yes it does! You can use parchment paper if you would like! Hi, thank you for this gorgeous recipe. I decided to make delicate squash because it’s so much easier without having to peel it. I found your recipe and I am in the process of making it now. Thank you! ? Delicious and will he on our thanksgiving table. We both loved this combination. Just far more delicious than it seems for the amount of time to make. I think you hit the jackpot! My family & I love this dish. So wonderful to have a squash (delicata) that does not have to be peeled. 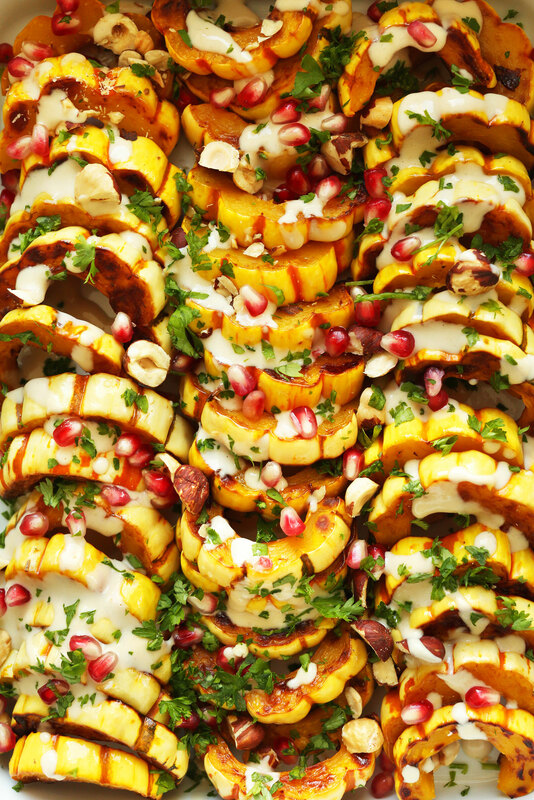 We love the flavor of all the ingredients especially the tahini, pomegranate with the squash. My DIL asked to have it for Thanksgiving. Your recommendation is spot on. FReakin’ delish! Healthy simple and wonderful. I’ve made this twice and will definetly make it a thanksgiving side dish as well. Just found & tried this recipe. 400 degrees for coconut oil seemed wrong as coconut oil smokes at fairly low temp but I trusted the directions. My house was filled with smoke, had to open all the doors & windows despite my great fan. Did you use a different kind of oil or a different temperature? This was the first time I’ve used Delicata squash and a first for using Tahini this way as well. Was pleasantly surprised how easy the Delicata is to use and how mellow it tasted. Didn’t have hazelnuts or pomegranate so used chopped pecans and chopped dried cranberries. Really interesting and different flavors for me and hub…we liked it and will definitely make it again! I made this as a Thanksgiving side last year. It looked really impressive and pretty, but the results were mixed. Some found the combination of tahini, squash and pomegranate seeds off-putting. This recipe is just delicious and it looks so beautiful. It actually looks like Christmas, or some great celebration meal and it is easy. I substituted pecans for hazelnuts. I didn’t fancy the dish much. the delicate flavor of the squash was overpowered by the tahini and the flavors just didn’t meld well . Thanks for the great recipe! Do you think dried currants used in place of the pomegranate would work? I’m thinking the acidity of both might be similar but you know the recipe best! Made this recently, and so very impressed. Even more simple to make than expected: basically roasted squash with simple ingredients on top. The pomegranite seeds really pull the dish together – and googling an easy way to get the seeds out was life changing. I used olive oil in place coconut oil. I paired the squash with simple quinoa (w olive oil and salt) and a simple dry grown tomato salad with dijon vinegarette and mushrooms. The combo was light and tasty, but needed a main to ground it. 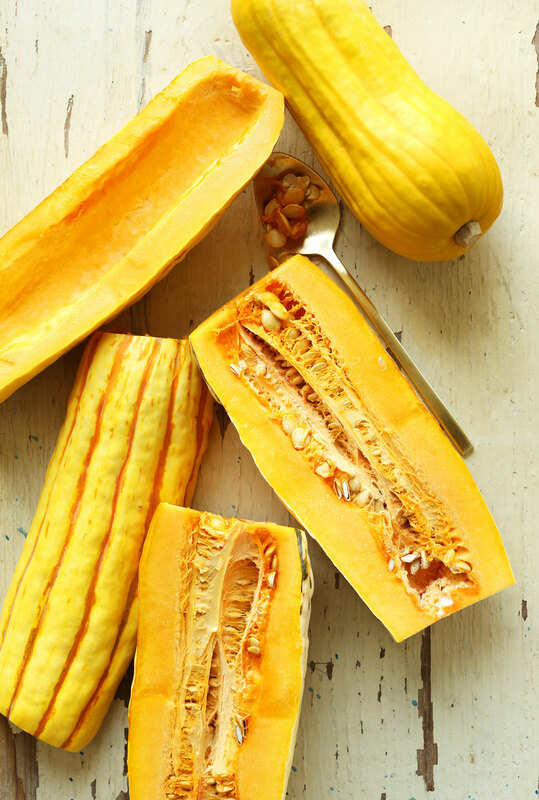 What is your favorite main to pair the squash with? Hi Leslie! I have a few dishes coming up soon that are lovely to pair this with. Otherwise, this Vegan Thanksgiving wrap! This may sound unusual, but I made this and used it for pizza topping! It was absolutely delicious! I’ve always enjoyed delicata squash, but my husband isn’t a real fan. While I was making it, I took little nibbles in for him to try and each one got a smile and tastes great! When I put it all together, he was intrigued and even ate a slice! I got the “I’d have that again” line and when I told him it was actually supposed to be a Thanksgiving dinner dish, he just smiled and shook his head saying, “naturally!” I can hardly wait to make it again! Thanks so much Dana, yet another winner! Is it possible to do this recipe with another type of squash, since Delicata squash is really hard to find in my country? You’re my absolute favorite blog- this is probably the 7th thing I’ve made of yours and it was delicious as everything else has been. I live in Portland too- do you do workshops or anything? Thanks for the kind words! Glad you’re enjoying the recipes. I don’t have any workshops at the moment, but subscribe to our email list or follow us on social media for any future announcements! yay! just in time, too! I just brought some home. I’ve been NUTS about kabocha squash. Because of your informative recipe, I now know that the skin of the kabocha, like the delicata is edible. Do you know if the skin on the Blue Ballet and Black Futsu are also edible? I made this instead of a sweet potato casserole for Thanksgiving and it was perfect!! It’s so easy to whip up and yet it’s amazingly elegant looking and ridiculously delicious. I never would have even thought to try this squash if it hadn’t been for your post. Thanks for all the amazing recipes – I haven’t made even one of yours that hasn’t impressed the masses. I made this last night and it was a huge hit!! I had delicata squash to work with and I used nature’s hollow maple which is a xylitol imitation maple syrup. Yay! thanks for sharing, Julie! 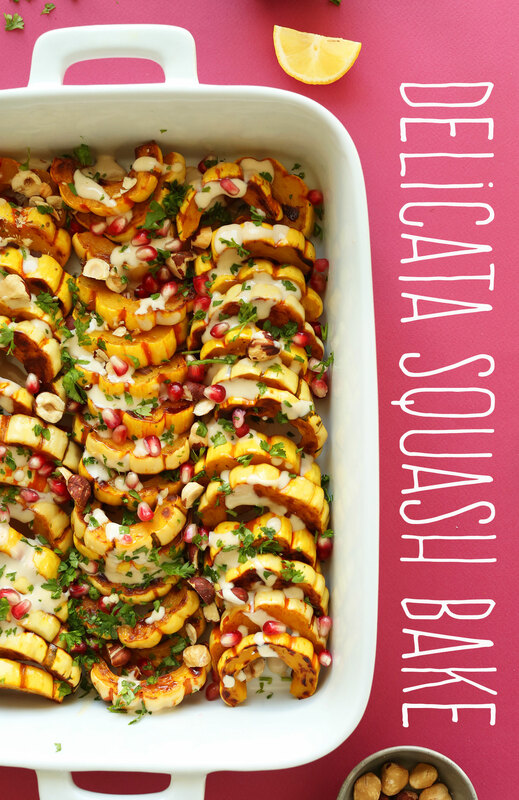 I made this with acorn squash because I couldn’t find delicata squash and it was amazing! How are your pictures always so flawless?? You’re a great food stylist, all your dishes look STUNNING! I’m glad I found this recipe just in time, I have a squash sitting in my counter and wasn’t sure what to do with it! I’ll post the picture soon :) Have a wonderful Thanksgiving! This dish looks amazing! I am having trouble locating this type of squash. Can you sub butternut or acorn? I’d think butternut would be the closest! Hi Dana, what a beautiful recipe! Quick question: tahini isn’t an easy find where I live in France– what would you suggest as an alternative if I’m not able to come up with it? A raspberry vinaigrette as mentioned above? Yes that would work! Or sub hummus! Do you think I can omit the hazelnuts or will that ruin it? I would certainly appreciate the courtesy of a response to my question, Dana, 7th comment from the top. Thanks. Yes it’s edible. Answer(s) above! Delicata squash is my favorite squash. It has so many great uses too! I really love it in salads but especially in soups. This is such a great way to really showcase it and so seasonally appropriate with the pomegranate! Thanks for sharing, Dana! I love when dishes not only taste good but look beautiful too! This looks amazing. I recently made my own tahini using black sesame seeds. It tastes like regular tahini, but looks beautifuly and dramatic. I bet it would be great in this! Ooh, that’s amazing! I’ll have to keep that in mind! Too much beauty and deliciousness in one recipe!! Looks incredible! Thanksgiving or no Thanksgiving I looooove this!! So delicious! Stunning! I swoon! I’m definitely making this gorgeous creation to take to December holiday parties! My family insists on Chipotle sweet potatoes for Thanks-Living but this recipe would be delightful as well. Thank you again, Dana for your inventive and yummy recipes! Have a wonderful week of cooking! Dana this doesn´t only look beautiful it does look amazingly tasty! 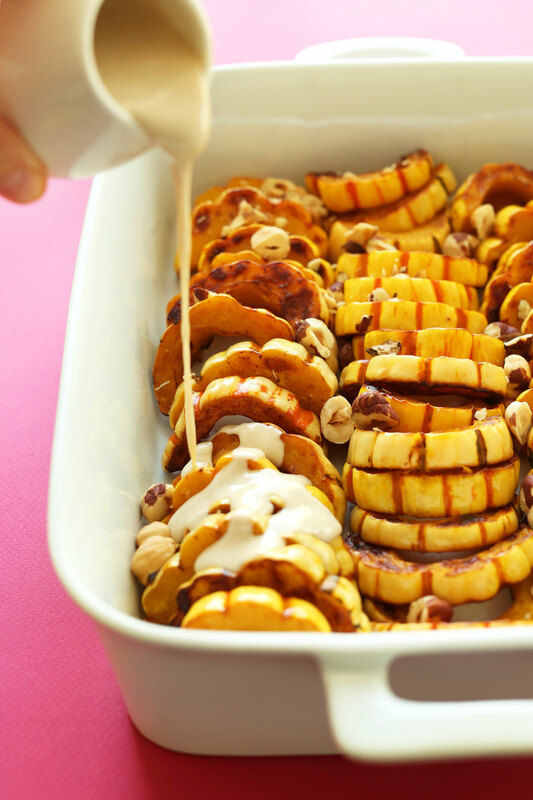 I´m gonna find delicata squash and I´m making this on the weekend! :) Thank you thank you! Fantastic recipe! Love the way you have cut the squash and the sauce is so perfect with it. A very colourful delicious dish. Wow, that is beautiful & looks to be delicious with lots of added crunch! Totally making this for my own Friendsgiving Dana. I think it’s a great and seasonally appropriate autumn harvest celebration dish that’s a welcomed departure from the mushy starch bombs typical of the Thanksgiving table. Really nice, bright, and beautiful. Looks wonderful! I love delicata squash, but have a hard time finding it at my grocery store. Next time I do come across some I am totally making this dish! Our squash looks different here! Does anyone know if this squash has a different name in Australia? What do you do about the skin, or rind? Surely it isn’t edible??? That’s the beauty of delicata squash, the skin IS edible! This looks beautiful, Dana, and sounds yummy – I will be making it soon. Someone else already replied but it is edible. I just made this and had the same question, the rind is very soft, the dish was delicious! Hmm, I’m not sure about honey mustard on this. Perhaps a raspberry vinaigrette? This looks too beautiful to eat but who am I kidding…?! I’ll definitely be making this and devouring every last bite! Woo hoo! Oh my gosh that looks so yummy! !